For the planets plus the Sun and the Moon to affect our lifes and personality, there must be a force that is strong enough to reach us, and have a profound impact. The claim the that Pluto, a planet about the size of the Moon can affect us when even when it is 7,228,829,857km from us is an extremely extraordinary claim, and so the force must be exceptionally strong. Let’s see if there is any evidence for such a claim. The 4 Fundamental Forces of Physics – Can They be Responsible? The strong interaction has greatest magnitude of all 4 forces, which is why it got its name. It is 100 times stronger than electromagnetism, 105 stronger than the weak interaction, and 1039 stronger than gravity. Quarks and gluons are bonded together as a result of the strong interaction. Curiously, this force doesn’t decrease in magnitude with increasing distance. Instead, once it reaches a limit (roughly the size of a hadron), the force remains constant at about 100,000 newtons. When quarks are pulled beyond a certain distance, it would be energetically favourable to create a new quark/anti-quark from vacuum. That’s why quarks are only found clumped together as hadrons, and no free quarks have ever been observed. This is known as colour confinement (not related to colour in the visual sense. In this context, colour is a property of quarks and gluons in the strong interaction). The residual strong force, as its name suggests, is a residue of the strong interaction. This force works between hadrons within atomic nuclei. The hadrons consist of mesons (made up of one quark and anti-quark; examples: pions and kaons), and baryons (made up of 3 quarks; examples: proton and neutrons). Mesons are transmitted between nucleons within the atomic nuclei, binding them together (and preventing protons from repelling each other because of their same electrostatic charges). Unlike the strong interaction, the residual strong force does decrease as distance increases, and is doesn’t exist beyond 10-15 metres. As electromagnetism decreases over distance at a much slower pace, the electromagnetism-to-residual nuclear force ratio falls in favour of electromagnetism as distance increases, causing nuclides with atomic number over 82 to be unstable. The reasons why the strong interaction is definitely not the force that affects our lives should be clear by now. The strong interaction only works between quarks and gluons, which are unimaginably small. Moreover, when pulled apart beyond a certain distance, quark/anti-quark pairs are created, and this means that there is a maximum distance between quarks. The same goes for the residual strong force, with its maximum range of effect of around 10-15 metres. To say that this force works on a planetary scale is simply absurd. The weak interaction is caused by the exchange of W and Z bosons (the intermediate vector bosons). It is called weak because it is 10−11 times weaker than electromagnetism, and 10−13 times weaker than the strong interaction. It is most notable for causing beta decay. The weak interaction affects left-handed leptons, quarks, and neutrinos (the only other force that affects neutrinos is gravity, but its effect are negligible). The weak interaction is the only known force that changes flavour. (not the flavour of taste; flavour in particle physcis means the quantum number of elementary particles.) Take beta decay for an example. For a neutron (1 up quark, 2 down quarks) to change into a proton, (2 up quark, 1 down quark), it must change one of its down quarks into an up quark. By emitting a W-negative boson, which then breaks up into a electron(e−) and antineutrino(νe). The laws of nature were long thought to remain the same under mirror reflection. The results of an experiment viewed via a mirror were expected to be identical to the results of a mirror-reflected copy of the experimental apparatus. This is called the law of parity conservation. Yet, in the mid-1950s, Chen Ning Yang and Tsung-Dao Lee suggested that the weak interaction might violate this law. Chien Shiung Wu and collaborators in 1957 discovered that the weak interaction in fact maximally violates parity, earning Yang and Lee the 1957 Nobel Prize in Physics. CP symmetry explains that when a particle is interchanged with its corresponding antiparticle (C symmetry, or charge conjugation symmetry), and left and right swapped (P symmetry, or parity symmetry), the laws of physics should be the same. Yet, it was found that the weak interaction may violate the CP symmetry, and thus create asymmetry in the universe. This is the most likely explanation of why there is almost only matter in the universe, as without this violation, matter and antimatter would’ve cancelled out each other. A simple diagram indicating the action of CP: CP reverses all spatial axes and takes particles to antiparticles. 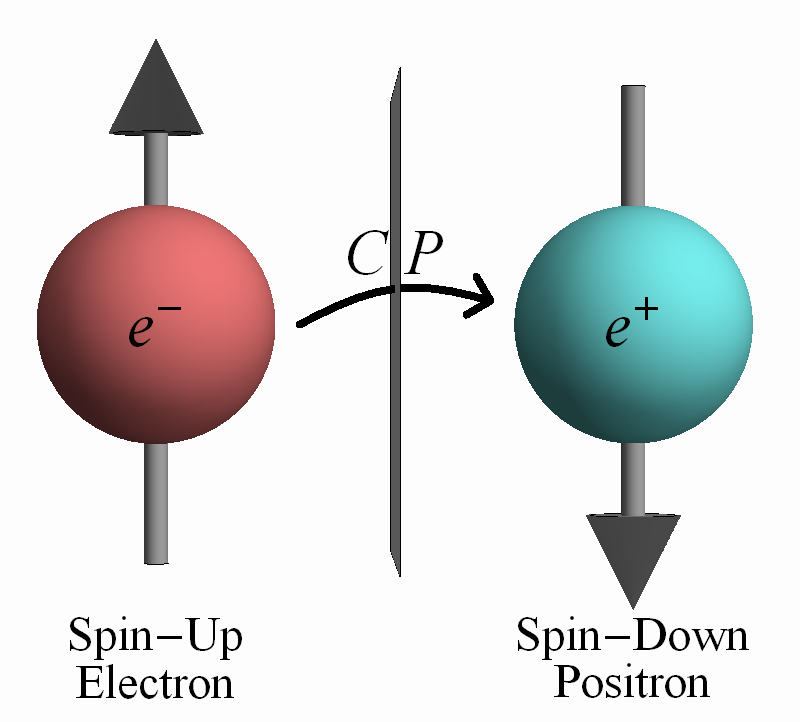 In this diagram, CP takes a spin-up electron to a spin-down positron. As the W and Z bosons have a large mass of about 90 GeV/c2 (on subatomic scales, that is), their mean life is only about 3×10−25 seconds. Even at the speed of light, the effect of the weak interaction is limited to a mere 10-18 metres, which is a 1000 times smaller than an atomic nucleus. That’s 1000 times smaller than the residual strong nuclear force, so how can it be expected to be the force that astrology claims? Next. As the force in which matter attracts and are attracted to each other, gravity is obviously the force we are the most familiar with, and we are all too familiar the story that an apple fell on Newton’s head (that’s fiction, but whatever). Despite being the weakest among all 4 fundamental interactions, gravity decays very slowly over distance and has infinity range, and is thus a likely candidate for the “astrological” force. General relativity is currently the best explanation of how gravity works, and is currently accepted as the best model of gravitation by the scientific community. Developed by Albert Einstein between 1907 and 1915, the theory is extremely successful in its predictions, but not perfect; we mustn’t doubt the overwhelming evidence available for it though. In terms of general relativity, gravity is caused by the curvation of space-time by mass, and that free-falling objects are moving along locally straight paths in curved space-time. These straight lines are called geodesics. It states that if there is a force applied to an object, it would deviate from the geodesics in space-time. Everything on Earth are not following geodesics, as gravity exerts force upon them. Although gravity spreads out infinitely, it’s effects still decay fast enough for the planets to have virtually none effect on the Earth. Jupiter, despite it’s massive gravitational pull doesn’t seem to affect the Earth’s orbit, much less Pluto (not a planet anymore in astronomy, but still one in astrology), with its smaller-than-Moon size and its unimaginably great distance away from the Earth. 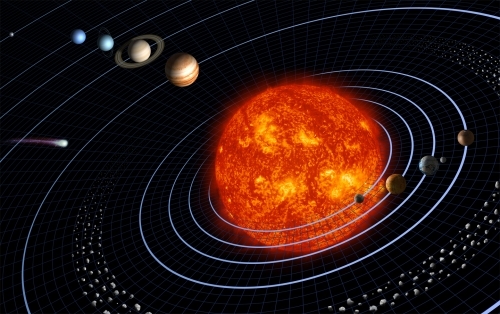 The only 2 celestial bodies in the Solar System that affects us directly would be the Sun, which locks us in orbit with it; and the Moon, which causes quite a number of tidal effects. Yet these are only a part of astrology, and thus gravity is no longer a candidate. Electromagnetism is the force that affects charged particles and is the most misused force ever is electromagnetism. Saying it brings mystics, feng shui, and yes, astrology to mind. However, electromagnetism is the most encountered force in life, save for gravity. Electromagnetism holds your body’s atoms together; cause electrons to orbit around atomic nuclei; cause the repulsion and attraction of magnets etc. 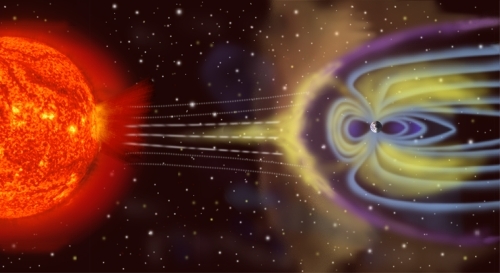 Artistic rendition of the Earth's magnetosphere. Astrology involves the planets, the Moon, and the Sun. But here’s the problem: only the Sun has a noticeable effect on the Earth. 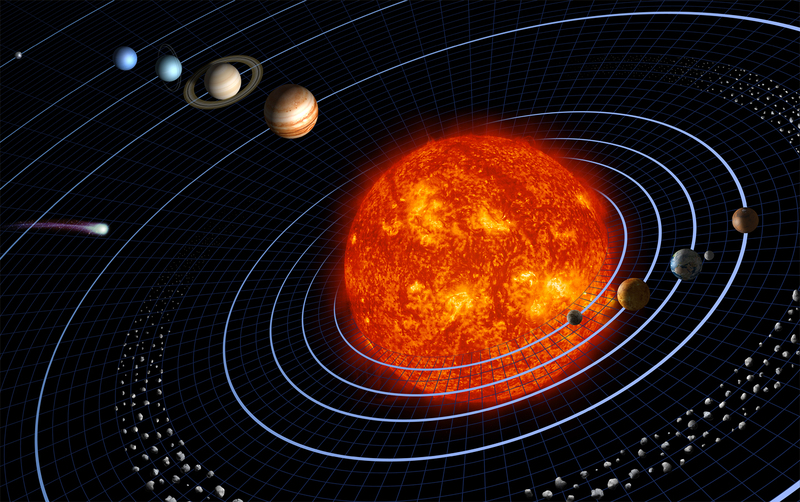 The only planets that have magnetospheres are Mercury, Jupiter, Saturn, Uranus, and Neptune, and of course Earth – the other planets’ magnetic fields are too weak. Yet even Jupiter’s magnetosphere, which 14 times greater than those of Earth, extends only 7 million kilometres in the Sun’s direction, which means that it doesn’t affect the Earth at all. Plus the inverse square law stated above, and it is clear that the planets cannot affect our lives as astrology claims. The only celestial body that affects us electromagnetically would be the Sun,the Interplanetary Magnetic Field (IMF), which is the magnetic field of the Sun that is carried by solar winds. What about a 5th, undetected force? The hard-headed new ager may claim: “So what? There may be an undetected force that works behind the scenes!” Of course, the onus of proof is on the new ager, not the sceptic, but for the sake of discussion, let’s entertain that possibility. 1. It mustn't decay over distance. All 4 fundamental forces of physics decay too quickly over distance to have any true effect on a interplanetary scale, and thus the 5th force must be constant in magnitude. However, this poses another problem. To prevent our brains from exploding, let’s just consider the celestial bodies present in the Milky Way. Well, it is estimated that there are 1011 stars in our galaxy. Isn’t it a bit naive to simply ignore all those stars in astrology? 2. It should be independent of size. Since astrology claims the Sun and Pluto to have equal effect on us, that means size must be ignored. Well, then perhaps we should take into account every single asteroid orbiting the Sun. After all, there are 70,000 Kuiper Belt Objects in the Kuiper Belt. 3. Or it could rely on some undetected property. Yes, perhaps science hasn’t detected a unique property that only the planets + the Sun + the Moon has. Such a claim however, will create even more wishful thinking for astrology, and thus will push astrology even more into the realm of blind faith. Moreover, astrology must explain the missing planets 4 planets in ancient astrology, and how could they have been accurate at all. And who is to say that there are no other planets now with similar properties? 4. Or it is sentient. Alright. This basically invokes something along the lines of the god(s)/deities. Nuff’ said. It is very clear now that simply isn’t possible that any non-sentient force can affect our lives and personality as astrology claims. The 4 fundamental forces have proved to be impossible candidates, and the 5th hypothetical force creates more problems than it aims to solves. The only alternative is to invoke the supernatural, but that simply puts astrology into the field of superstition, which it has always been since its separation from astronomy - the true science of the cosmos. Excellent post. It beautifully explains how astrology is impossible. The possibility of some sentience behind astrology brings up a bunch of philosophical problems and then there is the question of why it bases its actions (and ours) on the positions of the planets and stars. My working theory is that astrology evolved from observations that babies born at different times in the year exhibited different characteristics, in part because they would have different experiences during different developmental phases - for instance, a baby who reaches walking age in the dead of winter and learns indoors, surrounded by family, would have a very different experience than one who reached that age during summer, etc. By this basic theory, astrology would be a sort of celestial navigation, except instead of guiding you between locations without identifiable terrestrial reference points, it would describe the general forces likely to affect children during typical developmental milestones. The the majority of neural connections are made in the first few years, and the circumstances surrounding these milestones would clearly have some influence on brain developent. In ancient times and in rural societies, the factors might be even more pronounced, for instance, seasonal availability of nutrition and the amount of time parents had to pay attention to the children vs. other activities such as harvesting. For this reason, there are probably very vague and general correlations between birth month and personality and termperament, but the vast array of other factors renders this worthless for any practical purpose. The belief that celestial objects themselves physically affect the courses of our lives is really quite prehistoric -- from when observing constellations, length of day and sun position, and moon cycles did give valid information about seasonal change. In those days, astrology was a form of science, and it was early astrologers who used their knowledge of these patterns to develop symbolic representations of a calendar, so it's easy to see why these superstitions went right along with that. What's sad is when modern people attempt to use scientific terms to validate these ancient superstitions, in spite of the wealth of scientific fact available to completely disprove them. So, thanks for your efforts in doing this. Thanks, Lone Wolf, and Godlizard! By the way, godlizard, that's a great hypothesis (not gonna use the word theory, create too much confusion). I would like to add that the those characteristics doesn't need to be consistently observed among the people. All that is needed is someone with power (king, religious leader) believed in this, and the people will simply trust him and passed it on as a meme. Add the people's confirmation bias, and its not hard to see why astrology and other superstitions are so widespread. And I'm entertaining the possibility that it was used for politics. :-) Conspiracy theory, eh? Conspiracy? Heck no! Ronald Reagan was known to consult his astrologer in many important decisions. I guess we're lucky the stars never told her to tell him to press the red button! Yes I do know about Reagen. And yes, thanks FSM he did not press the "Doomsday" button! You're right its got nothing to do with science its synchronistic like any divination system, as any good astologer knows. Pseudoscience in a sense but not the perjorative sense, more non-science, science doesn't explain everything unless you want to make a religion of it.